We are already 2700 km on the road! Following the tips from a really nice traveler that we have met at the Florianopolis camping, we took the route 101 to get to Puerto Iguazú. The first kilometers were easy and relax, almost alone in the road with time enough to enjoy the views, with an awesome mix of greens!! Mountains, forests, valleys, rivers, lakes, small towns and that characteristic red soil everywhere. In the last kilometers we entered to the national park of Iguazú and the road change to a narrow dirt road through the jungle. We lower the speed and start the “landscape speed” trying to disturb the less as possible the nature and wondering us about the jungle, its trees, plants, flowers, butterflies and every kind of insects. The first part of the jungle was dry, really hot and the cars were lifting a lot of dust (from the red soil). The dust came from every small opening inside the van leaving everything red! Suddenly a tropical storm came and all that red dust became mud, a very red and sticky mud. In some points was not enough with de AWD and we had to use the differential lock to continue. Was a really funny adventure! Puerto Iguazú impressed me a lot, in some parts of the city were a lot of hotels and really nice bungalows with beautiful gardens and swimming pools and in the meantime other parts were still streets without pavement with a lot of big holes because of the strong rain, where the most interesting for the kids was jump in the puddles. We stayed at the “Agreste” Costa Ramon camping, highly recommended! Well priced, with hot water all day, Wi-Fi, pool, common area with barbecue, a beautiful setting and a very familiar treatment. Its owner, Carlos, is always joking and is always willing to help you in whatever you need. The visit to the Iguazu Falls not disappoint us, it was spectacular. It is very difficult to explain everything you live and feel in that park. Nature is alive and there you can contemplate it in all its splendor. The force of the water making its way through all the corners, reaching the 275 that make up these falls and the sound of the jungle and all its animals is just amazing. The largest mammal in the park is the “jaguareté”, a small jaguar very difficult to see, native and exclusive to this area of ​​the world and in danger of extinction. They are also monkeys and coatis, the last ones you can find in the rest areas of tourists, asking for food. In the air there are many species of birds, the most exuberant the big toucan, which we were lucky to see. We also saw lots of butterflies of different colors and sizes delighted with the visit of the tourists to be able to perch on them and absorb their salts, data that we learned in the park. It turns out that they feed on salts and in the jungle these are scarce, so they are usually seen in excrement, organic remains, animals and / or people, it is their way of eating! We also saw many insects … And in the water, alligators, turtles and fishes. Within this province the next point that we were interested in visiting were the ruins of the Jesuit missions of San Ignacio, very close to Posadas. Very little indicated and not very touristy but very interesting! The Guarani Jesuit missions began in 1609 and in them the Jesuits set out to educate and spread the Catholic religion among the natives and at the same time to protect them from the colonial forms of exploitation. Some of the advantages for the natives to live in a reduction were, besides escaping from Spanish exploitation, to escape hunger, to preserve their language, to advance in cultural areas and to organize their defense against neighboring tribes. There were also disadvantages such as the change of terrain, the loss of freedom as practiced until then and having to live with strange tribes. 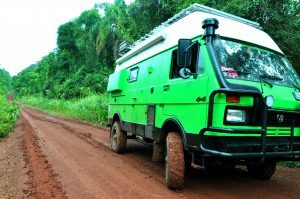 And so far our trip through Misiones, we said goodbye to Maciej, Gosia, Tomek and his unimog, but before Jose put his hand into the unimog and fix a couple of things that did not work well, he loves it! Amazing experience what you are living now! The waterfalls must have been amazing! !